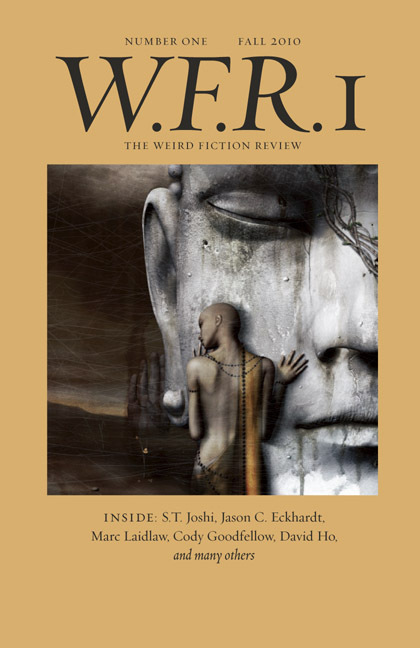 My Arkham House ephemera collecting pal John D. Haefele returns to print with “Far from Time: Clark Ashton Smith, August Derleth, and Arkham House” in the premiere issue of Weird Fiction Review from Centipede Press. John last got a blurb on this site when his booklet August Derleth Redux: The Weird Tale 1930-1971 came out — that title just caught a review in Europe. And weird fiction fans may also remember him for his research essay on how Derleth brought out the first major anthology of Robert E. Howard’s fiction, “Skull-Face and Others at Sixty,” in the September 2006 issue of The Cimmerian. I picked this one up just for John’s coverage of how Derleth chose Clark Ashton Smith as the next major writer he’d promote for the Arkham lineup, after H.P. Lovecraft. But Scott Connors also appears with an impressive statistic-filled article on how it was Lovecraft, not Seabury Quinn, who was the most popular writer for Weird Tales, based on the ongoing Readers Polls. And the short story by Jason Eckhardt was good — the rest of the contents I sampled the openings of, didn’t continue. I’ve found in thirty or more years of buying fanzines, that most you get only for one or two pieces, worth keeping around for reference. Very few are great in total, like The Cimmerian was in its heyday. The price on this issue is very competitive with current magazines, such as the new issue of Two-Gun Raconteur. Some of the Centipede price tags for their books are kind of unbelieveable, but this one is more or less current market value. And overall, very sharp looking, marred only by more typos than you’d like to see slip past the proofreaders. But if you’re like me you’d only want it for Haefele and Connors, and their articles are pretty clean, something you can consult for years down the road. This entry was posted in Lit, News, REH and tagged Arkham House, August Derleth, Centipede Press, Clark Ashton Smith, John D. Haefele, Lovecraft, Pulps, Scott Connors, Seabury Quinn, The Cimmerian, Weird Fiction Review, Weird Tales. Bookmark the permalink.